Purple cabbage is a simple salad can be easily prepare within minutes at home. 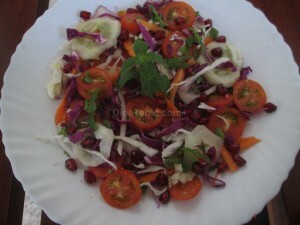 This recipe is a combination of pomegranate seeds and some vegetables like two types of cabbages, carrot, cucumber, tomato etc. Definitely children will love this salad as well as grown ups. Cabbage can be used to make as fry, curry, juice, pickle, cakes etc. Cabbage have many health benefits. It is a good prevention against constipation, headaches, obesity, skin and eye disorders, heart diseases, Alzheimer’s disease etc. Try this healthy salads at home & enjoy! Clean the green cabbage, purple cabbage and slice it thinly. Then clean the carrots, tomatoes and slice thinly in a rounded shape. Combine all these vegetable mixture in a bowl. Keep aside. Mix honey, vinegar, lime juice, olive oil, salt, pepper powder in a glass jar. Use spoon to stir well and keep aside for 30 minutes. Pour over the vegetable mixture and mix well. Decorate with mint leaves and pomegranate seeds . Tasty Purple Cabbage Salad is ready.